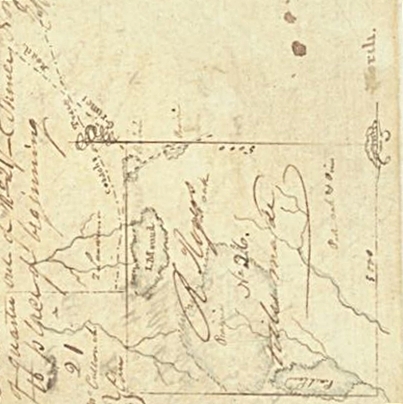 Below is the map prepared by Elias R. Wightman and included with his English Field Notes for League Number 23 [Benjamin Rigby League]. North is shown by the pointer that looks like half of a fleur de lis. 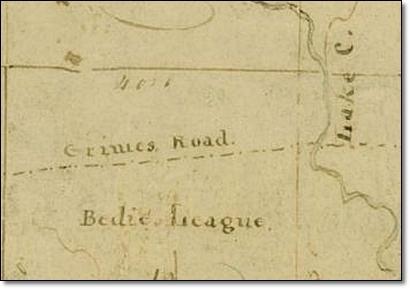 The map clearly shows a road that surveyor E. R. Wightman identifies as the Contraband Tra[ce]. File Number 6-438, English Field Notes, Benjamin Rigby League, Archives Record Program, Texas General Land Office, Austin. Shepperd’s store being located on the extreme west side of the John Corner League was located near what Austin Colony surveyor E. R. Wightman identified as the “Contraband Trace.” This trail ran north and south along the eastern side of the adjacent Benjamin Rigby League. [File Number 6-438, English Field Notes, Benjamin Rigby League, Archives Record Program, Texas General Land Office, Austin] According to the map accompanying the “English Field Notes” prepared by Surveyor E. R. Wightman for League No. 23 [Benjamin Rigby League] in 1831, the “Contraband Trace” is shown rising out of the northern portion of the Zachariah Landrum League and running along the eastern edge of the Benjamin Rigby League. 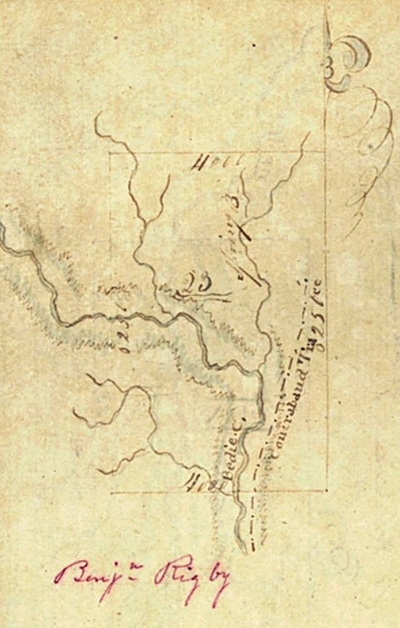 Howard N. Martin, “COUSHATTA TRACE,” Handbook of Texas Online (http://www.tshaonline.org/handbook/online/articles/exc05), accessed April 02, 2015. Uploaded on June 12, 2010. Published by the Texas State Historical Association. File Number 6-407, English Field Notes, Raleigh Rogers League, Archives Record Program, Texas General Land Office, Austin. 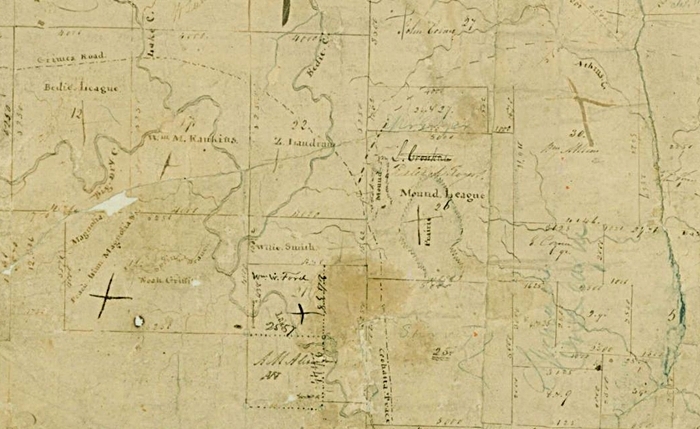 According to the 1831 map of land grants along the west fork of the San Jacinto River in Austin’s Colony also prepared by E. R. Wightman, a portion of the Coushatta Trace is labeled and shown running through five leagues of land that would later be part of the Lake Creek Settlement. The Coushatta Trace runs north and south through the Raleigh Rogers League [Iron Mound League] crosses over onto the Zachariah Landrum League and then back onto the Raleigh Rogers League. The Coushatta Trace then turns east so that it runs east and west across the John Corner League, the William Atkins League, and the William C. Clark League heading toward the west fork of the San Jacinto River.